As we approach the new year ahead, I am looking back over the posts from the past year. Taking the time to see what posts were popular, and which ones were not, helps to know what direction to go in the future, so I am sharing the top 5 posts from last year with you. #1 Master Mix Spanish Rice: This mix is so much better tasting then those prepackaged kinds from the store. You'll save money by making your own, and you'll know what's in it! #2 Boxed Scalloped Potato Mix: You don't need a dehydrator to make this kit, I've got oven directions too. Next time you find a great sale on potatoes, think about trying this one out! It's easier than you think, and you'll love having made your own convenience kits in the pantry! #3 Freezer Fruit Cocktail Mix: Making your own fresh fruit cocktail mix for the freezer is something you can do all year long, or one big batch in season during the summer. 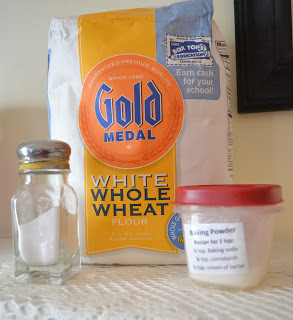 #4 Make Your Own: Self Rising Flour: If your like me, you don't keep a full bag of self rising flour on hand in the pantry at all times. No need! Here is how you can make your own, for whenever a recipe calls for it! #5: Freezer meals: Chicken and Stuffing Casserole: This classic comforting dinner will never let you down! It's perfect to make and take to a sick friend or elder parent to heat and eat too! Crock pot Kielbasa, Potatoes, and Green beans: this easy meal is in regular rotation in my house and it will be in yours too! You can substitute ham or chicken any time! Happy New Year! I hope you have a happy healthy 2017!